It isn’t really hard to do that, because the Oracle database has already everything build in to accomplish that. Create a SQL based report with the following SQL statement. The Oracle build-in HTTPURITYPE is really powerful, it will retrieve the content of an URL and if you specify getXML, automatically convert the XML output into an Oracle XMLTYPE. As soon as it is a XMLTYPE you can use all the XML build-ins to extract the data from the XML stream. 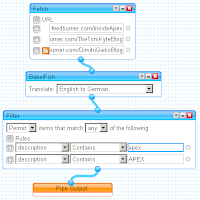 More info about HTTPURITYPE can be found at Carsten Czarski’s blog (in German). This entry was posted in Integration and tagged Yahoo Pipe by Patrick Wolf. Bookmark the permalink. This a really cool article. I was wondering how ot mix Oracle services with Yahoo Pipes and this is a really nice example. Well done. Can you explain how to set security on the report page so code like this can run? just google for ORA-24247 and you will find several entries. One is for example Oracle11g is more secure: PL/SQL Networking ACLs. Click “Show posting in English” in the header of the article to get an English translation.